Last night, for the umpteenth time the DAP Secretary-General and Penang Chief Minister boasted yet again that Penang has the lowest debt and claimed credit for it. Penang's RM1.5 billion in reserves outweigh its federal debt of just RM69 million, boasted chief minister Lim Guan Eng. But while the state can easily pay off what it owes Putrajaya, Lim said some debt is necessary. "I can call my financial officer right now and tell him, 'Datuk, go to the ATM machine and pay the federal government'. "But we have to keep some debt so that we can ask for money from Prime Minister Najib Abdul Razak," he said in jest at a fundraising dinner in Kuala Lumpur last night. 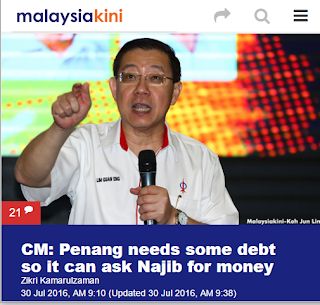 He said that if Penang had no debt, the federal government would assume it was well off and did not need more money. Penang's federal debt is the lowest in Malaysia. Propaganda is all about repeating a half-lies enough times until people start believing it is true. And DAP is very good at this. They have repeatedly claimed credit for this half truth probably hundreds of times since the year 2011. Unfortunately, it is a half-truth at best. 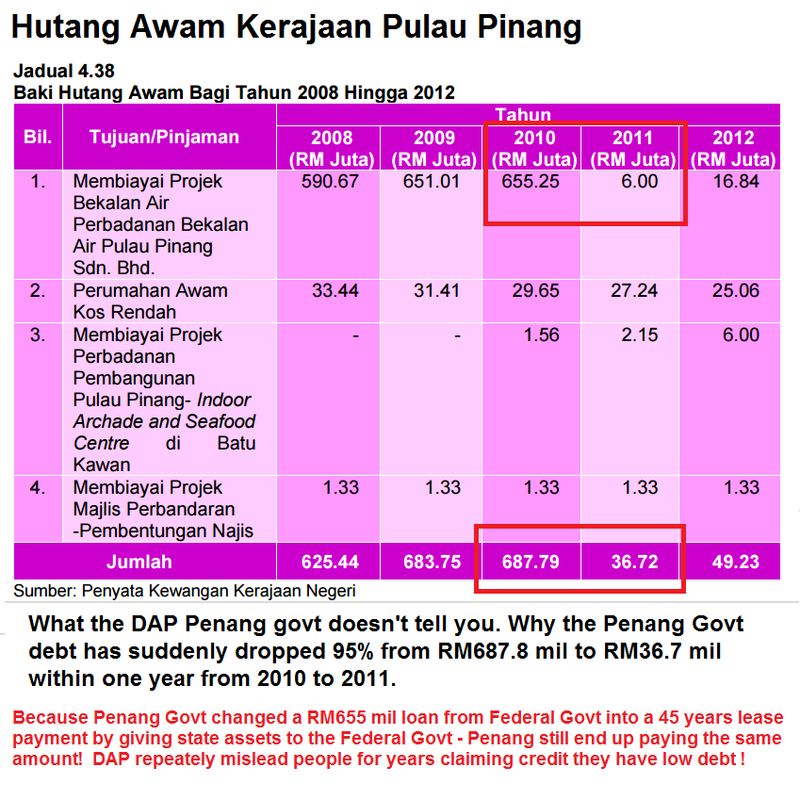 Misleading Propaganda 1: DAP Penang is great as it reduced State Debt by 95% due to good governance. This propaganda has been repeated hundreds of times by DAP. It is a half-lie actually. Let's look at page 38 of the Auditor-General's Audit Report 2012 on the Penang state finances. Yes. The Penang state debt was increasing every year until the year 2011 when it mysteriously dropped 95% within a year. This was because the Penang Government struck a deal with Najib's Federal Government where the Penang Govt gave state assets to the Federal Government and leased it back. Essentially, the Penang Govt just changed an existing RM655 million loan into a 45 years annual lease where the Penang Govt must pay RM14.56 million to the Federal Govt every year for 45 years. RM14.56 million X 45 years = RM655.2 million. Which means, the Penang Govt is essentially PAYING THE SAME AMOUNT! To the easily-cheated supporters of DAP and gullible Penang people, they would not know the difference - allowing DAP to keep repeating this shameless propaganda over and over again since the year 2011 to cheat the people. I am not sure how thick-faced you need to be to keep repeating this in public. If you don't believe me, listen to this fellow who thanked the Federal Govt in the year 2011 for doing this deal. When Lim Guan Eng made the above press statement he has pretty much confirmed that it was the Federal Govt taking over Penang State assets and convert the loan to a lease (which is the same thing as you end up paying the same amount) which has allowed DAP to keep claiming they have reduced 95% of the Penang State Debt due to "good governance". Not only that, but that same press statement of his also betrayed another long-standing propaganda that the Federal Government does not help the Penang State Govt. Not only has the Federal Govt waived the 3% interest on the previous soft loan but it had also given RM1.2 billion free grant to the Penang Govt for a much-needed dam expansion. What kind of persons who got helped by someone and then use this help to mislead others and repeatedly over 6 years to whack back the same persons who helped you? 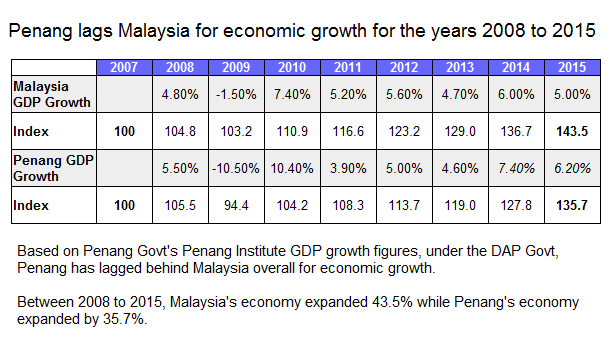 Misleading Propaganda 2: Under DAP, Penang has outperformed Malaysia in economic growth due to DAP's "Good governance"
The following table was released by the Penang State Govt owned Penang Institute last year. According to DAP MP Zairil Khir when he said Penang will bounce back after the recent mass factories closing , that table is not updated but the actual growth, instead of forecast growth for Penang is higher at 7.4% for 2014 and 6.2% for 2015. Penang had benefited from the weak Ringgit in 2014 and 2015 as electronics manufacturers exports more - hence the better 2014 and 2015 figures. And these are the official figures from the Penang Govt's Penang Institute themselves here. Despite DAP's continued propaganda that Penang has enjoyed much better economic growth compared to Malaysia,, the actual official figures do not suggest that. According to the state-owned Penang institute itself, Penang's economy has under-performed the national average for the entire 2008-2015 period. Correspondingly, the BN Penang Gov's last two years in charge showed that Penang grew faster than the national average - despite what DAP claims. If you think that there is nothing wrong that Penang Govt now spends almost 4 times as much per year of Wang Rakyat compared to 2008 and that aggressively selling depleting state land and assets to fund this dramatic increase in spending is "good management" then you can stop reading here. In fact, without selling state land, the Penang Govt would have been in BIG and INCREASINg DEFICITS for the past 5 years straight. If you want to know more, please read my past article titled "Penang financial management: An unsustainable bloat?" for the details. Lim Guan Eng and DAP used to repeatedly boast (and still do) that they are number one in investments among all the states in Malaysia. That may be true twice - for the years 2010 and 2011 - but to a large extent was from the good work of the previous BN state government as it takes a few years before a large investment is committed. At that time, Lim Guan Eng had quoted these figures from the Federal Govt agency MIDA and you can verify the table below from the same information from MIDA here. Since 2011 though, Penang has not been number one for total investments in Malaysia for 4 years now. It has lagged further behind other states. According to MIDA, last year in 2015, Penang was the 5th highest state in new investments at RM6.72 billion and ranked just behind Melaka. It pales in comparison to Johor which recorded RM31.1 billion or 5 times higher than Penang, and Sarawak at RM11.82 billion. And in 2014, Penang came in 3rd and drew RM8.16 billion in investments - behind Johor's RM21.18 billion and Sarawak's RM9.64 billion. Even as Penang's annual state government spending has almost quadrupled, their investments performance has lagged the other states which have surged ahead. In fact, Johor's combined investment for the two years of 2014 and 2015 totaling RM53 billion is more than the entire combined investments in Penang for the past 6 years of RM42.6 billion. So far this year, Penang still lags in investments and is 3rd. for the January to March quarter. This is one of the most often repeated lies by DAP to justify their continued selling of state land to fund their 4 times increased in yearly state spending. Again this is a lie which you can read about and examine the evidence here in my previous blog post titled "BN sold more land than Pakatan in Penang and collected less' ?? Probably the longest repeated allegation despite being corrected dozens of times but DAP don't care and continue repeating this since it sounds nice. In fact, DAP actually apologized in court once for repeating this lie. You can read more about it and examine the evidence in my previous post titled "Did Lim Guan Eng really go to jail for defending a Malay girl?" This is a new piece of propaganda which is being used to pretend that Lim Guan Eng was falsely charged for corruption. He himself is repeating this in nationwide ceramahs and numerous recent press statements - despite this being subjudice and contempt of court to talk about the case as it is already in the courts which may lead to more court charges against Lim Guan Eng. This is an outright blatant lie. Examine the evidence, watch the videos and read about this in my previous blog post titled "SSSLGE: Lim Guan Eng Explains Why He Is Not Guilty." If DAP is unhappy with my blog post above. they can dispute and point out where it is wrong or they are welcome to sue me. Other propaganda like DAP's famed "40 years of flooding solved within 9 months" or "we can solve floods within one term".is made to look stupid due to ever increasing flooding in Penang in recent years. Titles such as "UNESCO Heritage City", "Penang Top Ten most Liveable City" and "Penang being a top electronics manufacturing hub known as Silicon island" which DAP keeps claiming credit for are also something not new. The Heritage City status was granted in June 2008 - just 3 months after DAP took power in March 8, 2008 and is really the result of efforts by the previous GERAKAN Govt over many years. It takes many years before such a heritage status is approved, which it was (together with Malacca) in 2008, which Dr Koh Tsu Koon rightly claimed credit for. 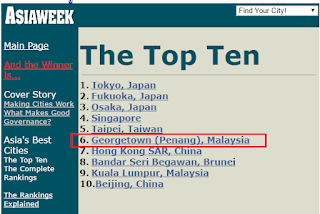 Penang has also made it into the list of Most Liveable City for more than a decade before DAP took over,, which you can see in articles such as this when Penang was number six most liveable in 2001. As for Silicon Island, the late Dr Lim Chong Eu and the past BN Government takes the credit as even in the 1990s, Penang was already among the top 3 electronics exporting region in the world. 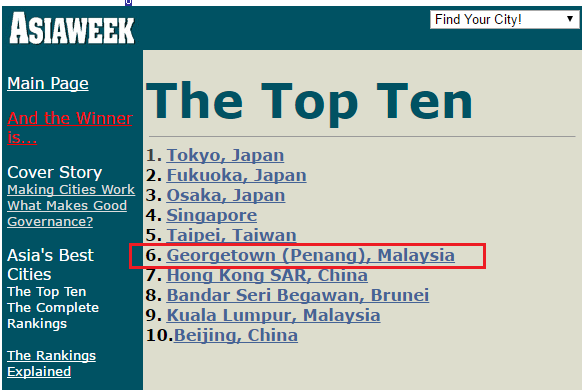 You can read about this in this year 2000 Bloomberg article titled "Penang's Secret". Lim Guan Eng would also try to claim credit when a new factory is set-up in Penang but will he also take the blame when Nine major foreign factories in Penang shut down and retrench workers “Silicon Valley in the East” in critical situation as is happening now? Even the Lonely Planet stating Penang is a top tourist destination last year in 2015 was much trumpeted by Lim Guan Eng but he remained strangely silent about Lonely Planet latest 2016 list which had Ipoh at number 6 of top 10 places to visit while Penang had dropped off the list. But Lim Guan Eng and DAP do deserve some credit too. For one, Penang has street murals now. And the streets are cleaner (not hard since they sold so many billions of ringgit worth of land and can easily afford the additional RM10 million per year extra to clean the streets). Also, the local food Char Kuey Teow and Penang Laksa still remains delicious and was recently endorsed as world's best food destination by a renowned food writer. If DAP or Lim Guan Eng can prove that they invented these then we can similarly praise them for the food too. Propaganda and " clever accounting" by Penang State Govt, that's what it is. Sadly the Dapsters wants to believe it so much that Dap is smarter and better than BN, that it leaves them blind,deaf and somewhat dumb! Since chinese believes in previous lifetimes, I wager LGE in previous lifetime might have been Goebbels himself or at least a student under his tutelage. To the very end, original Mr Propaganda still believes in his own lies as he faced the hangman. I see this same similarities in tokong. Sadly even if Lim dynasty somehow are able to be stopped, it will take a generation of Malaysians (esp Penangites) to be de-toxify of the DAP hate propaganda. Just like it took Germany, but Goebbels only had 10 years worth of work, Lim tokongs had 50. So is this RBA last resort? When all reason fails, just bring out playground bully tactics and call people names? What are you people, 5 years old? So its okay to imply Najib is Mugabe, but not LGE to Goebbels. Then how about his father LKS to Hitler, then? Housing for Rakyat/ working class?? No richmen exist without loyal workers. And loyal workers exists only with their own permanent base. No kampong, no apartment, no affordable housing Penang is not the nicest place for the global richest to stay..never Penang for vacation like hawai or gamble centre like Macao, Singapore..
Then economy & cultral heritage vanish..
LGE & penang DAP deep dark secret plan is to shaft all those loyal workers to mainland Seberang Prai while the rich towkays stay on island. They do it by killing all low-cost housing and raising cost of living on island until its unbearable for the poor. When people are about to lose hope, then their propaganda machine kicks in to promote Prai as the alternative cheaper option for these people. Flocks of people who can no longer live on island will move out, while the rich and politically connected moves in. Thats how DAP plan to make the island "prosperous", by making it not fit for locals to stay. Mark these words if they still around another 10~20 years on the island. And no one else to blame but Penangites themselves. state gomen's debt - the thing (land/asset swap) was already in the pipe-line during tsu koon's time. The thing is kura-kura is highly unlikely to crow from Botak Hill that he single-handedly wipe out Penang's debt because he was so godamn smart, he out smarted himself. If BN were still in control, it probably just end as a footnote in AuditorG Report and kura-kura won't need to hold road shows around country to show that he is doing work. An excerpt of Malaysian corruption and scandal? Penang is struggling on every corner. Enough for such propaganda . Solve this rapid inflation in house prices, new rules for landowners, will there be a property bubble soon? Western countries are making things new by combating issues of properties to turn their rooms into rental apartments, engage on shared economy, like Airbnb. Malaysia soon will be the fastest Airbnb hosting country should corruption never stops. Homeowners found themselves secured by joining Roomz.asia especially this time of inflation. US DOJ says "YES" but 1MDB says "NO". Why?